This charming beach hotel is located close to the entertainment zone of the sandy Playa de Gandia. The hotel is located just 150 metres from the beach where guests can enjoy water sports, leisurely strolls or simply choose to lie back and relax amidst the sun-drenched surroundings. Gandia town lies just a 10 minutes' driving distance away, while the culturally-rich city of Valencia is a 45 minutes' journey by car. This modern hotel enjoys an attractive architectural style, welcoming guests with warm hospitality and excellent service. The hotel provides an abundance of excellent facilities with something to appeal to guests of all ages. The guest rooms are beautifully appointed, providing an inviting escape from the bustle and routine of daily life. The emblematic RH Bayren Hotel & SPA is located on the front line of the beach, next to the magnificent promenade, in a central area of Gandia Beach. The golden sand, palm trees and warm climate through most of the year are just some of the attractions of this exclusive location. All interior and exterior spaces have been renovated, So that the RH Bayren Hotel & SPA continues to be the best option for those who visit and at the forefront of tourism and a great choice for our guests Rooms are comfortable and relaxing with a modern design. Most with pool & sea view and equipped with modern and functional furnishings that will make your stay a great experience. New exterior spaces, new additional pool & hydro massage with bubble beds, all surrounded with garden areas, in which you can find a variety of palms trees, protected for their singularity. The ""Mare Nostrum"" acclimatized indoor restaurant has a terrace facing the sea, our ""Chef"" offers a buffet with an excellent selection of Valencian dishes, fideuá, paella, etc. .., and also show cooking for international products. We also have special products for celiac & diabetics. Our two outdoor pools stand out, with hydro-massage and bubble bed, solarium, loungers and “Pool Bar”, all of it surrounded by gardens. On the top floor of the hotel you will find the “Moonlounge”, peaceful and where you will find a great atmosphere and music, enjoy a drink, or sip cocktails in the magic of summer nights in the best area on Gandia Beach. New for 2014, this spring we will open the “Bay Beach” snack bar on the beach in front of the Hotel RH Bayren & SPA, where our guests can enjoy the comforts and services of the hotel on the beach. If you want to relax in our spa area, you can enjoy the heated swimming pool, Jacuzzi, sauna, steam bath, Scottish shower "rain shower" & our new floating capsule or keep fit with cardio vascular exercises. If you just want a massage or specific treatment you will be attended by trained personnel. Marblau Apartamentos Varios 2 Bedrooms offers accommodations throughout the area in Gandia. 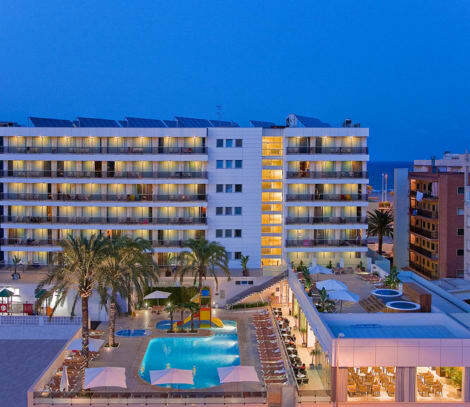 This hotel lies just 125 metres away from the beach of Playa de Gandia. It is situated close to the bar and restaurant zone, where guests can enjoy the lively ambiance and delightful dining options. The centre of Gandia town is just a 10 minutes' driving distance away. Many attractions can be found in the area. The hotel is just a 45 minutes' driving distance away from Valencia. This modern hotel oozes charm and sophistication. The guest rooms echo the beauty of the surroundings, featuring subtle tones for a peaceful ambiance. The hotel offers a pub, as well as a cafe bar. Guests can dine in style in the elegant surroundings of the restaurant. With a stay at Cibeles Playa in Gandia (Grao de Gandia), you'll be within a 10-minute walk of Gandia Beach and Gandia Marina. This hotel is 6.7 mi (10.7 km) from Oliva Beach and 1.1 mi (1.7 km) from Platja de Venècia. 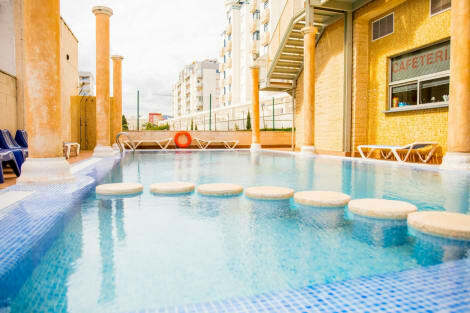 Ideal to enjoy a relaxing stay with family or friends, this hotel enjoys a convenient situation in Gandia, a city located on the eastern part of Spain. Close to a long sandy beach and just a few steps from the yacht club, guests staying at this property may have the chance to practice water sports such as windsurfing, sailing, kayaking, or just soak up the Mediterranean sun. A wide choice of different accommodation options is offered to suit all their needs. Ranging from single to spacious quadruple rooms, they all feature a functional design and offer all the necessary conveniences to enjoy a comfortable stay. Dining options include a restaurant with terrace and breakfast buffet while those travelling on business may take advantage of the two large multipurpose rooms that can accommodate up to 150 people. Recently constructed and located in the most central area, just 50 meters from the beach and promenade, ideal for exercise: walking, cycling or simply strolling along to enjoy the breeze from the sea and the beautiful views. The Hotel RH Gijon 3* has rooms available with stunning sea views. Comfortable and spacious rooms, almost all of them have a balcony and most have sea views. Fully equipped bathroom, piped music, TV, hair dryer and mini-bar. The products served on our buffet are of high standard homemade and Mediterranean dishes (Please bare in mind that swimwear is not allowed in the dining room and that gentlemen must wear a short sleeved T-shirt) During your stay you can relax in our SPA, which includes: Jacuzzi, Bithermal Showers, Turkish Bath and Gymnasium. The hotel also has free Wi-fi connection. In the summer months we recommend a visit to our Chill Out terrace on the 12th floor of the hotel, where you can enjoy fabulous views of Gandia Beach and try some of our cocktails. 50 meters from the hotel is the Clot de la Mota Park, with a wide range of leisure and sports activities and free public parking. The Hotel´s comprehensive facilities, the fact that it is near the City of Arts and Sciences in Valencia and the Terra Mítica, Terra Natura and Safari Vergel theme and leisure parks, as well as Valencia´s first rate golf courses, all make it the perfect choice for your holidays or short breaks all year round. lastminute.com has a fantastic range of hotels in Playa De Gandia, with everything from cheap hotels to luxurious five star accommodation available. We like to live up to our last minute name so remember you can book any one of our excellent Playa De Gandia hotels up until midnight and stay the same night.